...that the Forerunners stored data exclusively in quantum foam-based substrates? 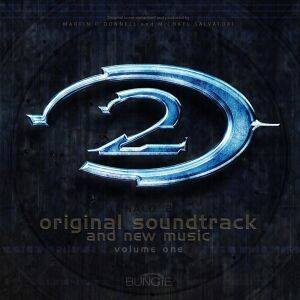 The Halo 2: Original Soundtrack is the musical score for Halo 2. it was composed and produced by Martin O'Donnell and Michael Salvatori, with a few tracks by Incubus. While the Halo: Original Soundtrack was released in a single album, the Halo 2: Original Soundtrack was split into two volumes, which were released almost two years apart. Volume One was released on November 9th, 2004 and Volume Two was released on April 25th, 2006. Rather than keep the medley form from the Halo: Original Soundtrack, the Halo 2: Original Soundtrack focused more on suites with different chapters, similar to movements in a symphony. Unlike the Halo: Original Soundtrack, the Halo 2: Original Soundtrack focuses more on heavy guitar riffs and beats as evident in the redesigned Halo Theme Mjolnir Mix. As such, O'Donnell brought in several bands and guitarists (such as Incubus and Breaking Benjamin) to help compose some of the music. Volume 2 of the soundtrack differs greatly from Volume 1 in the presentation and form of the music. While Volume 1 is made up in a "movement" form, Volume 2 focuses heavily on suites. As stated on the Volume 2 inlay card, Martin O'Donnell details why he chose to use this structure: "I decided to use a 'suite' structure that corresponds to the chapters within the game. In a sense, by listening to this soundtrack, you will hear the musical representation of the story of Halo 2." A remastered soundtrack of the Halo 2: Original Soundtrack was re-recorded and produced by Skywalker Sound and released on November 11, 2014 for Halo 2: Anniversary. Volume 1 also included an excerpt of the Covenant Writ of Union. Volume 2 also included an excerpt of the Covenant Ratification Parley. When played in reverse, Destroyer's Invocation from Mausoleum Suite on Volume 2 plays a cryptic message from what is thought to be the Gravemind or Mendicant Bias. Halo 2 has the most unreleased music of all of the Halo soundtracks. For a complete list, check out our Soundtrack directory.